Home | Grades 6 to 12 | SSAT™ Test Prep New! 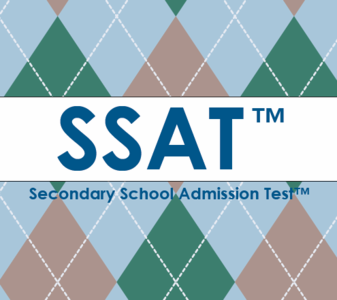 Home | SSAT™ Test Prep New! Our SSAT™ Middle/Upper Level Workbook Bundle (Grades 5-11) provides practice for students so they can become accustomed to the types of questions included on the Secondary School Admission Test™ (SSAT™). Separated into English and Math books, each includes overviews, tips, worksheets, quizzes, drills, and appendices for the Writing Sample, Quantitative, Reading, and Verbal sections of the SSAT. Each workbook also includes answer keys and explanations for all quiz, drill, and review questions. Our Verbal Analogies Workbooks provide extensive practice for students so they can become accustomed to verbal analogies (grades K-5+*), including those found on the SSAT™ assessments. *It is very important to note that the grades assigned to each level are general suggestions. It is entirely possible that a younger child would excel with the higher-level questions, or that a student in the upper grades would struggle with the earlier-level questions. A student’s performance on these questions depends greatly on their vocabulary, exposure to analogies (which are not typically taught in school), and other student-specific variables.